Quirky, Chic and really Simple Mehndi Decoration Ideas for Your Mehendi and Haldi Functions! An outdoor mehendi/haldi is my absolute favourite. Add in some quirky decor like cycles and rickshaw and you’ve got yourself a perfect function. I found some of the best mehndi decoration ideas to add some quirk and a pop of colour to your mehndi event! Scroll down and take inspiration! Bicycles are rapidly gaining popularity as a decor item. Decorate it with marigolds, or add some colourful tassels or some really witty and punny one liners. You can turn this one into a photobooth eventually. 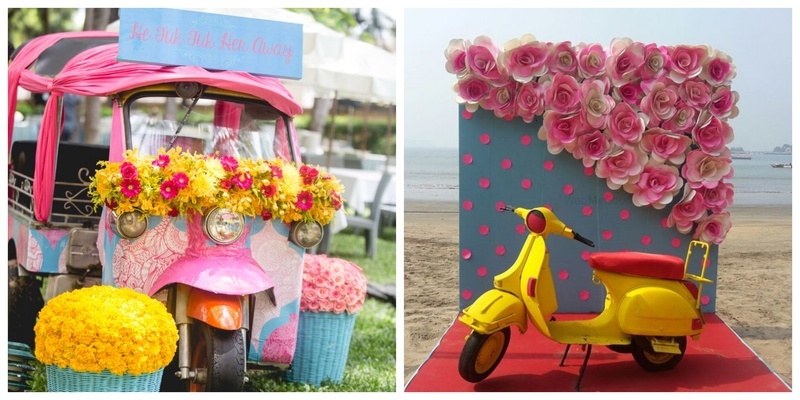 No one ever thought that a rickshaw will be used as a decor prop one day. Colourful rickshaws are making the rounds of mehendi/haldi functions quite often now. This is one rickshaw that won’t refuse you! If you ask me, haath gadi or hand carts are the best places to keep mehendi favours. Doll it up with drapes, marigolds or in anyway you want. This can turn out to be a really cheap mehndi decoration DIY idea! Now that Vespa is back in fashion why not incorporate it in your mehendi/haldi function? It’s a super cool addition to your already cool event. Keep it against a beautiful backdrop and you’re done! These mehndi decor ideas will keep the glam and fun in equal proportions. Let us know if you have any such ideas or how you made your mehendi a quirky function!